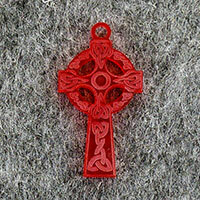 Medium acrylic High Cross (Cross with a halo (nimbus)) with a Celtic knot work motif style A. Detail on front plain on the back. Size 36mm height x 20mm width x 3mm thick hole diameter 3mm. Also avaliable in pewter and wood as well as in a larger size pendent in acrylic, pewter and wood as well. Designed and manufactured in our own workshop from a large range of different acrylics. We design all our own acrylic pendants, buttons and beads. We also manufacture a large range of other jewellery items in acrylic, clay, wood and metal. If you can't find what you want on our site please contact us to discuss you requirements.